Bay Shore Barnes & Noble will host Frank Vetro, author of Standing on Principal, for a riveting discussion of the powerful memoir that is sweeping the nation. Saturday April 16th, Barnes & Noble, 842 Sunrise Hwy, Bay Shore, NY 11706. 5-8 pm. "A riveting read about corruption in the Education field." 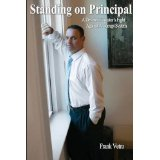 On Saturday April 16th at the Bay Shore Barnes & Noble author Frank Vetro will discuss his memoir, Standing on Principal. On February 8, 2006, Frank Vetro, the young, popular principal of a school in eastern Long Island saw his life dramatically altered. He was arrested for a crime he didn’t commit and thrown in jail for what authorities effectively labeled as an act of terrorism. This inspirational story details his tenacious fight to clear his name and exposes the rogue elements that destroyed his life without a moment’s concern for fairness or truth. After losing everything and living in his car Vetro recreated his life. He works with the courts and school districts on Long Island, educating youths who have been arrested and kicked out of school, and need a second chance. Frank also serves on a board for a not for profit organization in New Jersey and Manhattan, promoting racial harmony and acceptance, and helping youths develop positive values and self-worth. He hosts two radio shows, “Standing on Principal” and “The Frank Vetro Show”, broadcast live on 103.9 FM LI News Radio and WLINY.com. They’re a blend of social and political news commentary, and have attracted politicians and other high profile guests. Frank has interviewed nationwide, held book signings, and contributed to monthly newsletters. He’s a mentor and life coach, and his public speaking has captivated audiences. Vetro continues to share his tragic yet inspirational story in hopes of helping others and spurring change. Boulevard Books is an educational publishing company for the 21st century. Founded by author and educator, Avi Gvili in 2010, Boulevard Books aims to publish those voices who say something new about the world in which we live.